The only way to stay closer to the ocean would to be in a boat. Sit back and watch the cruise ships slowly pass by knowing that the passengers aboard are truly envying your incredible accommodations. This quaint and unassuming second story home offers a nearly 180 degree of the mighty Pacific ocean where you can relax and watch whales as they suddenly breach the blue water, spinner dolphins playfully chase a passing fishing vessel and the rising sun as it welcomes you to an amazing array of morning colors. If you are searching for a Five Star Luxury Hotel then this is not the place for you. The Loft is all about the views! So, if you are looking for a clean and simple place to lay your head that also offers incredible views then this may be your choice. We want our guests to be pleased with their accommodations therefore we are completely transparent about the Loft. The Loft at Pali Lani is situated on the same beautiful, tropical paradise as our other listing; the Pali Lani Seaside Lodge (VRBO #507322). These two homes can be rented together at a discounted rate or separately. While they do share the same tropical acreage, they are separated far enough to where privacy is not an issue. Both homes share the same covered parking area however have separate entrances. With nearly 2 acres of lush gardens surrounding the home, there is plenty of space for all. Immediately as you enter the home your attention is drawn to the vast ocean front windows and sliding glass doors that lead out to the huge deck. Here you can spend endless hours enjoying the cool breezes from the ocean, sipping on a morning cup of coffee or watching spinner dolphins and whales playfully swim by. During whale season, there may even be nights when you can hear the whales singing. Hilo is known for its warm aloha spirit, relaxed lifestyle, unique shops, art galleries and restaurants with local regional cuisine. Local attractions include Lyman Museum, East Hawaii Cultural Center, historic Palace Theatre, Pacific Tsunami Museum, Imiloa Astronomy Center, UH Hilo Performing Arts Center and Hawaii Tropical Botanical Gardens. Hilo Farmer's Market is a favorite for fresh, local produce. Merrie Monarch Festival, Hilo's premier hula competition and cultural event, is held annually. Hilo's black sand beaches are some of the best for snorkeling, diving, surfing, paddle boarding, kayaking, swimming with turtles and tropical fish, or watching the whales off shore. Take a helicopter volcano tour or short scenic drive to active Kilauea volcano to view a lava flow, ride horses in Waipio Valley or tour the summit and view the night skies of Mauna Kea. We are near Highway 19, 15 minutes to Hilo and only 20 minutes to the Airport. Please remember that you can rent both The Loft at Pali Lani and the Pali Lani Seaside Home together at a discounted rate. We also own another property, Old Sugar Mill Plantation, which is only 4 miles away. It is a great, ocean view home and can accommodate up to 16 persons. Click on 'See our other listings' on this website or you can cut and paste the below into your browser. I am truly blessed to be not only a resident of the Big Island but to have the opportunity to manage such an incredible home for my dear friends. Helen and John, the owners, share my compassion in ensuring our guests feel the true spirit of Aloha while staying at either of the Pali Lani homes. So that our incoming guests know, in Hawai'i, we like to hug a lot! So if you reach out to shake a hand here, don't be surprised if they give you a hug in return. While you are here, you are family! It's the Hawaiian way of life. Relaxing on this raised deck takes you to that state of relaxation where nothing else seems to matter. Something about absorbing the sounds, smells and views of the ocean in this special place brings a sense of peace like no other. This property is the perfect fit for couples or small families desiring to stay oceanfront and yet not break the bank. It also is the perfect compliment to the main house also located on the same property. Many large families and groups reserve both homes together. Located at the end of private road, and surrounded by lush gardens and vegetation you will feel as though you are in another world. Yet, it is a short drive to all the conveniences of Hilo Town. You cannot get any closer to the ocean without being in a boat. 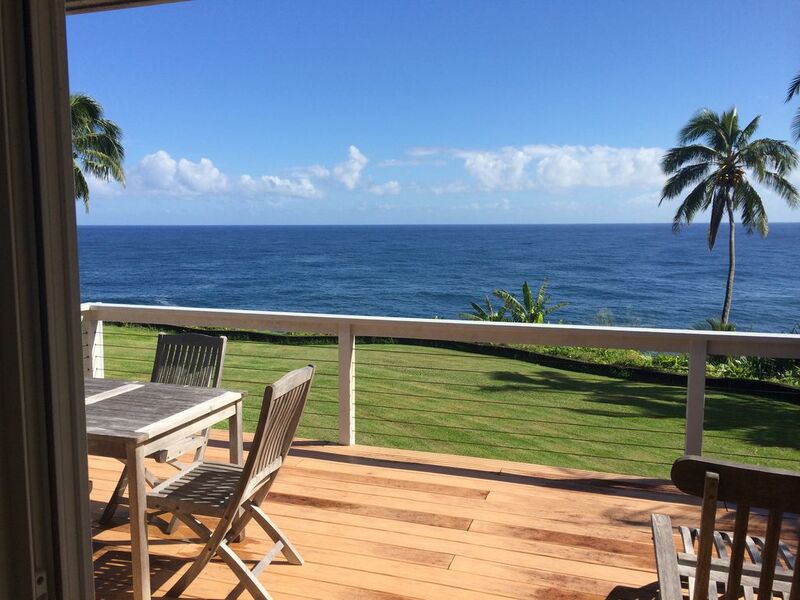 This remarkable home sits high upon the beautiful seaside pali (seacliff) offering out of this world panoramic views. Parking is in the garage/carport below and is shared with the adjacent main house. In house linens are provided however beach towels are not. We try to supply everything you need to prepare meals except for the food. Nearly Hilo offers many nice grocery stores including a new Safeway, Target, KTA and Walmart. A nice, flat screen television is situated in the living area. Oceanic Time Warner Cable channels are offered. Located inside a gated, tropical paradise, there are nearly two acres of lush tropical plants scattered throughout. There is even a great lemon tree that produces delicious lemons in season. The fabulous, ocean front balcony offers a great teak table that seats four. Also, there are two teak steamer chairs where you will find hours of relaxation. This amazing property is located adjacent to the main house which is also on VRBO and can be viewed under listing 507322. Both are available together at a discounted rate. Feel free to contact the property manager for additional details. I stayed 12 nights, just clearing mental and emotional clutter. Greg, the property manager was kind and helpful as he could be. Great ocean view, lots of whales, sunrises, full moon reflecting on the water silhouetting palm trees on the shore. Nearest meals are Strato’s New York Pizza in Honomu, What’s Shakin in Onomea and then tons of choices in Hilo. To the north Papa’aloa Country Store is nearest for groceries, wine and eat in/take out. The location of the loft is a 5. The manager Steve was responsive to our cries of help and tried to come help(several times), but was limited by the setup of the house/loft combination, and the cable company. The issues had to do with limitation due to it being an "add-on" to the main house. 1) There is very limited(or no) AT&T service at this location, so we were dependent on the "included landline" Unfortunately we were only able to make 1 call out during our 5 day stay due to some issue with the line being a patch off the main house line. Steve tried to fix it, but was stumped. While a phone is not typically a huge issue during vacation, trying to finalize plans or coordinate is limited without phone service. 2) TV- also caused by by loft being "patched out" from the main house. No one realized the cable service had gone all digital thus requiring a cable box. TV also is not necessary on vacation, but with an active Volcano on the island, updates via TV, and some mindless relaxing downtime would have been nice. 3) Internet(yep, the old Main house issue) in the loft is spotty to non-existent. The "solid" internet is by connecting to the cable router in the main house. We could at best get 2 bars when sitting on a chair at the kitchen sink. The couch, maybe 1 bar on a good day, and it would go in and out due to the distance. They had a wifi repeater, but it was less useful than the router in the other house. 5) The bed in one of the bedrooms was "broken" or something. Anyone lying on the right side of the bed immediately rolled into the middle. 6) As other reviews have said, the outside/lanai furniture is raw wood, so even the not broken items have rough surfaces, while the table had a major rotten area, and several chairs had a broken or missing crosspiece. The main house looked nice, and we will look into staying there in the future. We would probably not stay at the Loft again. Loved the loft! It is at a great location and easily found with the directions supplied (even after dark and in the rain). Just a few issues were found with the items in the loft - the coffee maker does not heat the water, it is just warm; some of the windows and the wooden deck furniture had mold on them. Even though the deck furniture was very worn and uncomfortable to sit on with shorts, the view and sound of the ocean made it very well worth sitting out there. The information provided regarding restaurants and shopping were very much appreciated. The grounds are beautiful. The number of flowers, trees, birds, and frogs/geckos were great. We did see 2 geckos in the house. After knowing they were there, it didn't surprise us when the would come out. All in all, we loved the place and would recommend to others going to visit Hilo. After visiting Kona, we were especially glad that we chose to stay in Hilo. It was much more laid back and peaceful. Breakfasts looking out into the deep blue, watching the weather drama from so close and appreciating the nature surrounding the place-deep sleeps to the ocean break noise. Needs a little more attention to cleaning-drawers in dressers specifically. Lovely view and very convenient to Hilo town. The furnishings and appliances are in need of attention (one mattress was in need of replacement, the couch and outdoor chairs were uncomfortable and in need of attention, the coffee maker worked but came apart so needed some jimmying). The owner agreed to look at the mattress. Also the main room had a lot of termites as well as a lot of gecko poop at all the corners. As a Hawaii resident this is to be expected somewhat but not this much. I certainly would not try to dissuade anyone from staying here, especially if you want to explore the windward coast of Hawaii. Again, beautiful views, great location, a very functional place, but cleanliness was less than expected for the price. Arrival instructions are emailed approximately 30 days prior to the scheduled arrival date.